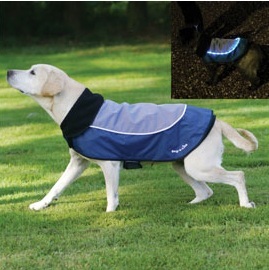 The Rosewood Night-Bright LED Jacket is an innovative safety product which combines water resistant coat with LED lighting which keeps your dog safe in low lighting while brightening the path for both dog and owner. Comes with a removable, washable inner fleece and warm fleece collar. Below are some recent questions we've received regarding Rosewood Night-Bright LED Jacket for Dogs, including answers from our team. Wondered just how water resistant it is, not that either myself or Tibetan terriers appreciate heavy rain ! Are your measures for the length? What are the neck measures? Thanks for your question. The measurement is from the collar to the base of the tail. There is no neck measurement as this is adjustable to fit most dogs. The battery pack is hidden in the waterproof pouch and batteries can be easily changed.